THIS SECRETARY IS 31 INCHES WIDE, 45 INCHES HIGH AND 151/2 INCHES DEEP WITH THE WRITING SHELF CLOSED. WHEN THE WRITING SHELF IS OPEN IT IS 31 INCHES DEEP. FROM THE FLOOR TO THE TOP OF THE OPEN WRITING SHELF IS 30 INCHES. WHEN THE WRITING SHELF IS OPEN IT EXPOSES 6 CUBBY HOLES AND AN OPEN STORAGE SPACE. BENEATH THE WRITING SHELF ARE THREE FULL WIDTH DRAWERS. 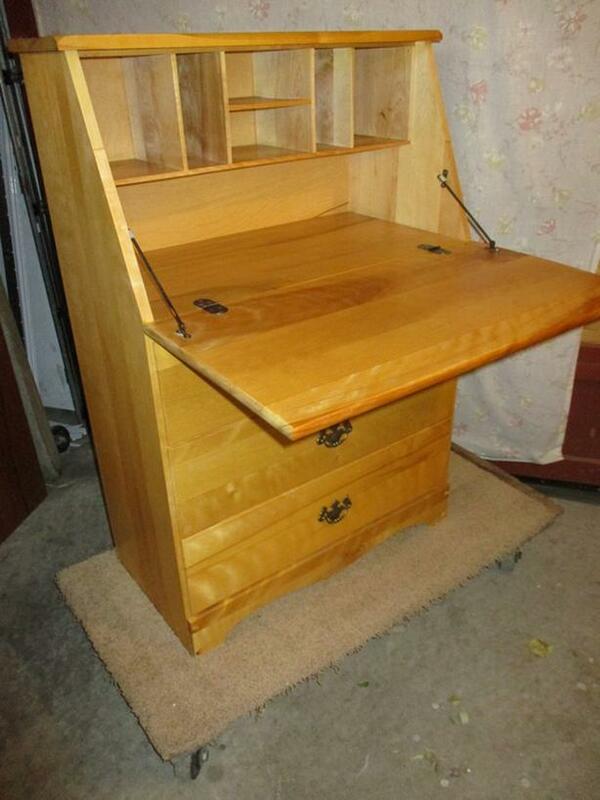 THIS SECRETARY/STUDY DESK IS IN EXCELLENT CONDITION, CLEAN AND READY TO USE.